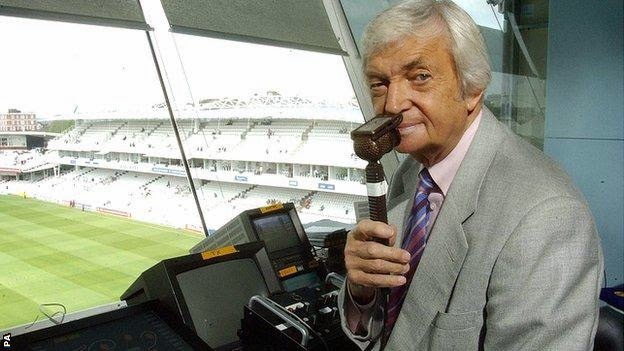 One of the finest cricketing brains and an absolute legend, Richie Benaud, the former Australian Captain passed away aged 84. He fought a hard battle against skin cancer which finally came to an end. Here’s a tribute to the great. Richie was born in Penrith, New South Wales in the year 1930. From a very young age itself, this lad had keen interest in the game. He came into the scene primarily as a middle-order batsman but later turned into an all-rounder after learning the art of leg-spin under the watch of his father. He had a looping back-lift which was suspicious against pace but he boasted of a wide attacking stroke range that made him a genuine all-rounder. 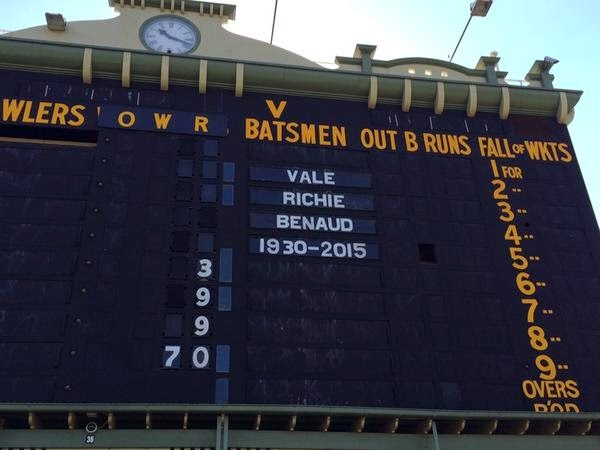 The 1948-49 domestic season gave him his first break as he made his debut for the New South Wales team at the Sydney Cricket Ground. Though he promised alot in school cricket, he had a forgettable first match as he could not contribute to the team after scoring just 2 runs on a green top while his spin was not used by the captain. Further, playing against Victoria, he was struck on his head, causing a fracture in his skull, diagnosed after 28 X-rays. This sidelined him from the rest of the fixtures. Decent performances in the next season got him his first Baggie Green in 1951-52 in the series involving the West Indies. He got a place In the playing eleven only in the fifth test after Australia had gained an unasassible 3-1 lead and wanted to try out some young players. Though his debut was similar to the one in the domestic level- A Failure. He could only manage scores of 3 and 19, and picked up the wicket of the West Indian tail ender- Alf Valentine. His figures read- 1-14 (4.3). I doubt if people will remember him as a successful cricketer, only because he was far more successful and effective with the microphone than the bat or the ball. Such is the story of this man who has defined the art of commentating! While other commentators would use two words to describe, he preferred to use one and still be more effective than his counterpart. Tony Greig , Richie Benaud and Mark Nicholas formed the best trio at this. Cricket will never ever witness again such a great combination. I must say, Heaven has the best commentary team. And who can forget the way he accompanied Shane Warne’s Ball of the Century in 1993. 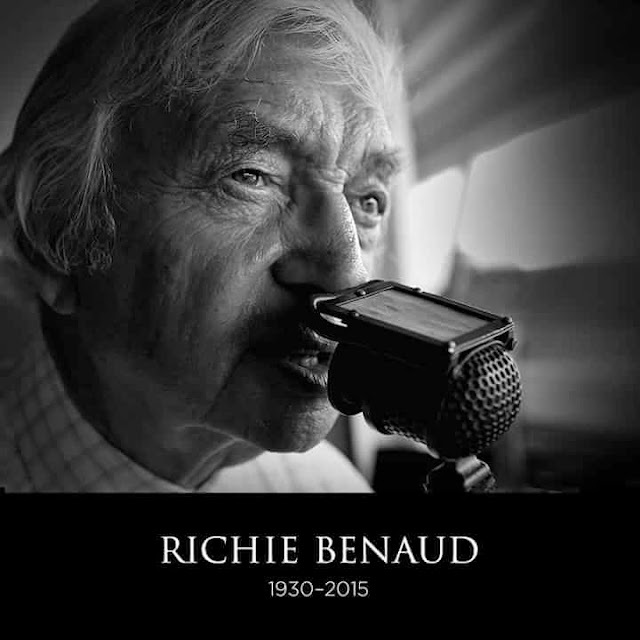 The Aussie participated in 235 matches as a commentator in a career spanning over 42 years. The period can be rightly called as “A Golden Era”. I consider myself to be luck to have witnessed this maestro at work. The only thing, I regret is Glenn McGrath interrupting him by taking Kevin Pieterson’s wicket in the 2005 Ashes series, as the match was nearing an end and Richie, in his last match as a commentator, was signing off. However we all will remember him by his trademarks – the much talked about Cream jacket and the sight of a flamboyant leggie in his stride with an open shirt. 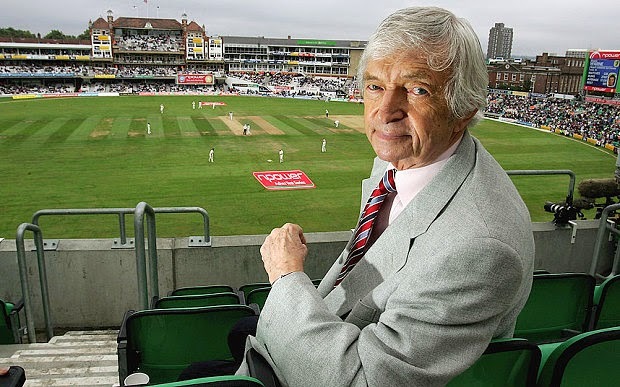 Richie Benaud passes away after a battle with skin cancer - a tribute to the great.